"I was a civilian member of the Air Ministry Meteorological Office and one of the first members of a unit later identified as the R.A.F. Mobile Meteorological Unit (MMU). The MoD didn't publicize our existence until about 30 years later when they printed an article in the MoD Procurement Executive. 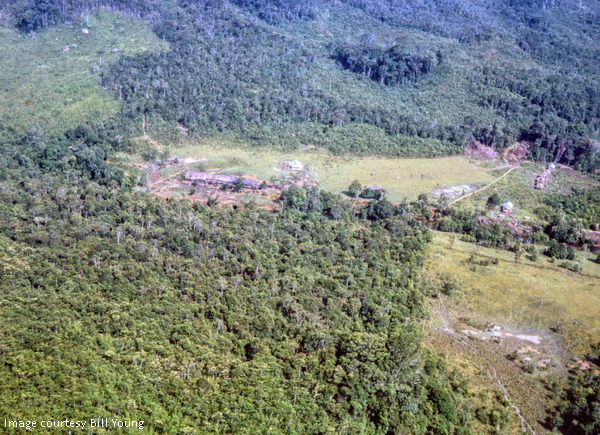 I was transferred to HQ FEAF, Changi, in mid-1963 and posted to COMBRITBOR in Labuan within two days. There I was operating within 224 Group under Sqn Ldr P McAllan (I think that's how Phil spelled his name). 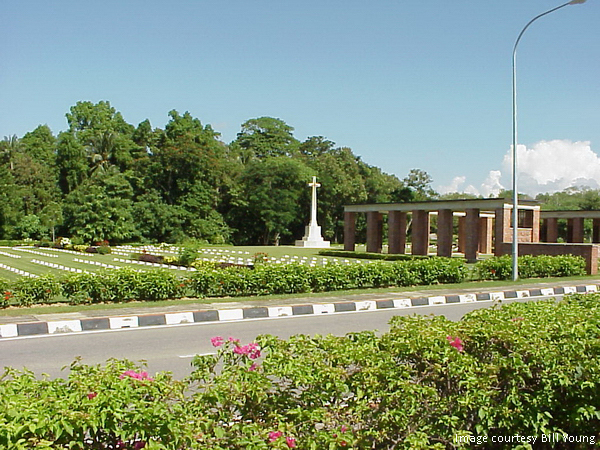 I resided in the 'comfortable' Labuan Airport Hotel, the Officers Mess, and remained there until about five months later when I was medically evacuated to Changi hospital for return to the UK thro' R.A.F. Hospital, Wroughton. 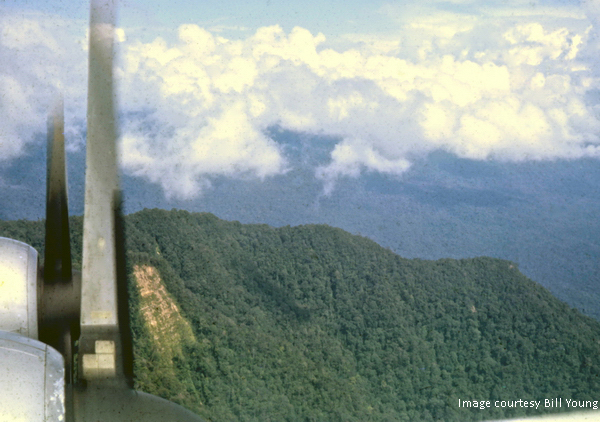 During the time in Borneo our role was to supply weather observations and forecasts in support of the flight operations over the mainland for the R.A.F., Malaysian Air Force (after Sabah Merdeka) and 3 A.A.S.O., the Army Support Unit. 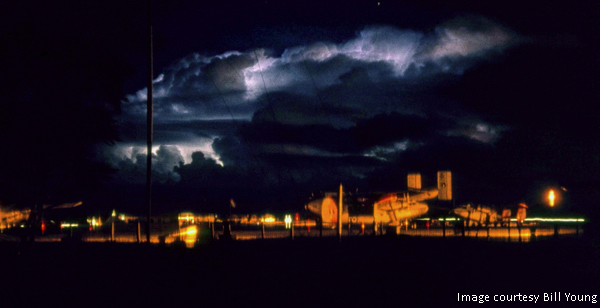 My own role included flights to forward bases on supply drops, carrying out Meteorological observations en route. 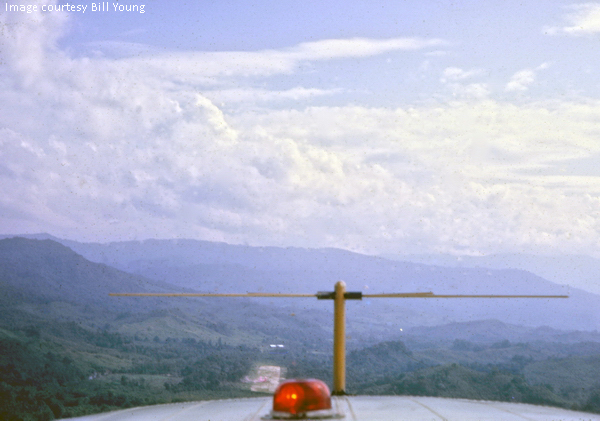 I still have some colour slides taken during trips including over Bario. I have been back in Borneo to see how it has changed. Some things were the same and others vastly different. Progress? Well, maybe!" Here are his images. We think they are stunning and will bring back memories to all of us who had occasion to fly over Malaysia/Borneo, whatever the weather. 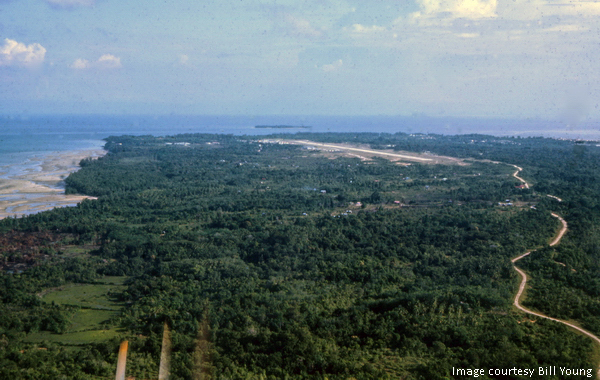 Dispersal area, Labuan airfield. That Valetta is still stationary, but won't be for long. 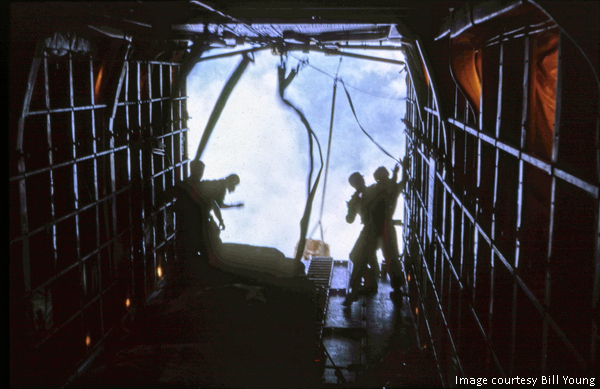 "During the tornado that destroyed the hut below, it was reported that the Valetta had been lifted into the air, turned around, and then put back on the deck. Only the undercarriage covers suffered any damage." 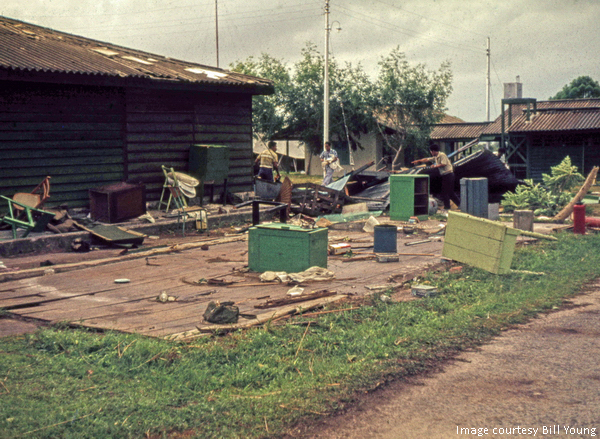 The hut that was destroyed by the tornado that did the pas-de-deux with the Valetta. The tornado was reported in the Meteorological Magazine. 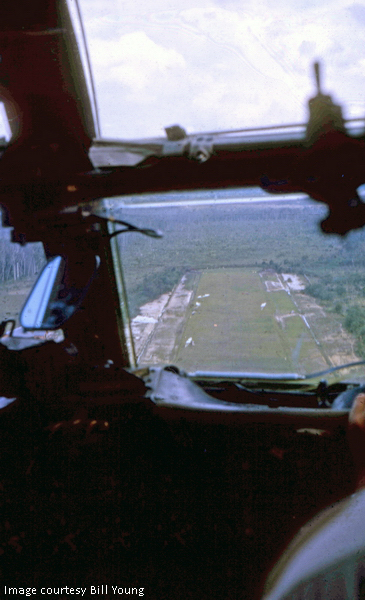 On a drop over Bario. 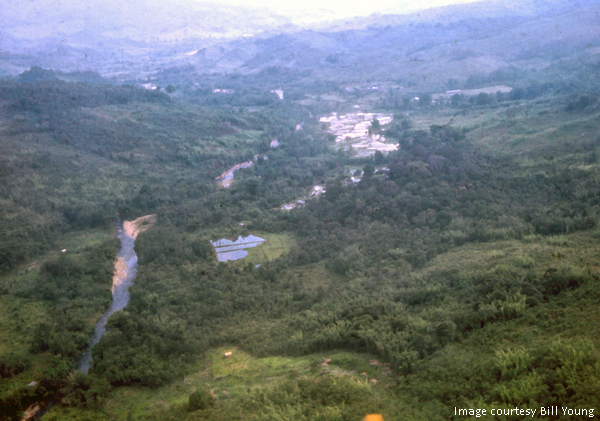 This photograph was taken on a drop over Long Semadoh. 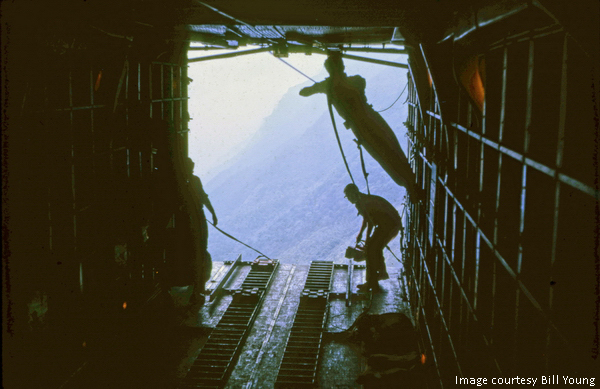 "Long Semadoh, as I remember it, was on the top of a ridge with a steep drop off each end of the strip. Turning a Beverley in the valley was a tight manoeuvre with lots of engine noise. The Centaurus engines were temperamental. They quite often gave problems before take-off and I remember several drops being cancelled due to this. Parking was easy, though. With reverse thrust and the nose-wheel lever it could be backed into a tight slot." Now I remember why I never aspired to be a dispatcher! [Ed] "
"One of the Beverley trips was to take Gurkhas inland. They were in the tail boom as we flew a rather turbulent trip due to the time of day. They just about matched their kit in colour after the journey! 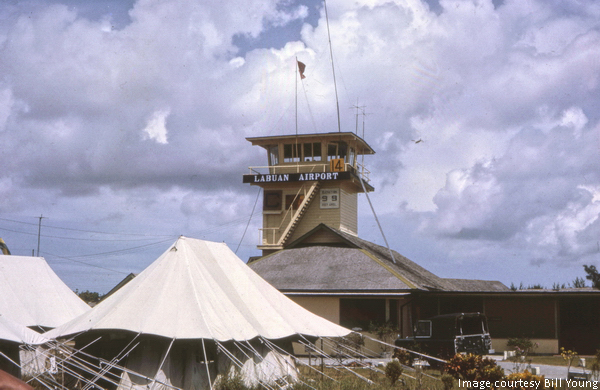 We had a Canberra based on Labuan for a while. As you can see from my photo we also had a recce Meteor. 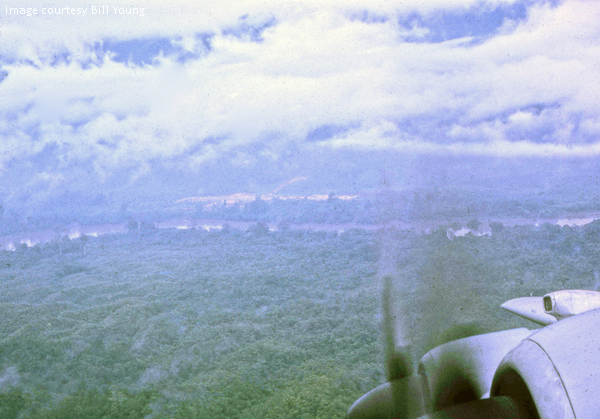 After Sabah Merdeka the Malaysian Air Force brought in a Twin Pioneer. Several Navy Wessex helicopters with their supporting tiny Renault trucks moved in from HMS Bulwark and became shore based. After the Belvedere crash (XG473 on May 4th. at Long Merarap) in which nine people were killed most helicopter and light aircraft flights were restricted to a dawn to13:00 window. This was to avoid the likelihood of a fierce downdraft from a cumulonimbus such as was thought to have caused the Belvedere to come down. Due to the lack of accurately surveyed terrain maps our minimum operating altitude on instruments was 9000ft amsl(*). The Beverley could stay up later than most. On one occasion we nearly joined the monkeys in the branches when a ridge suddenly appeared ahead whilst in we were in cloud. Hairy manoeuvre! 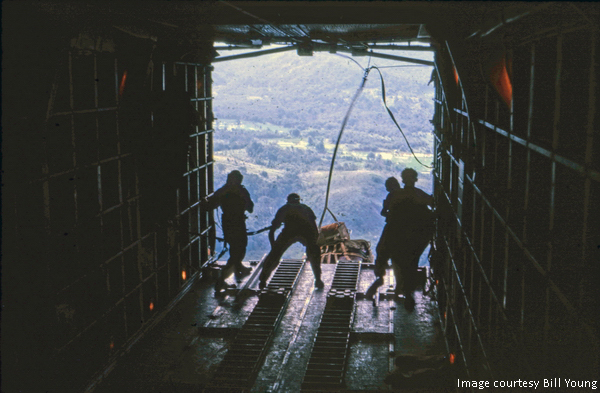 When they brought the Argosy out it was so underpowered that it couldn't work much above 9000ft which meant it was on the limit for operations over the mainland. 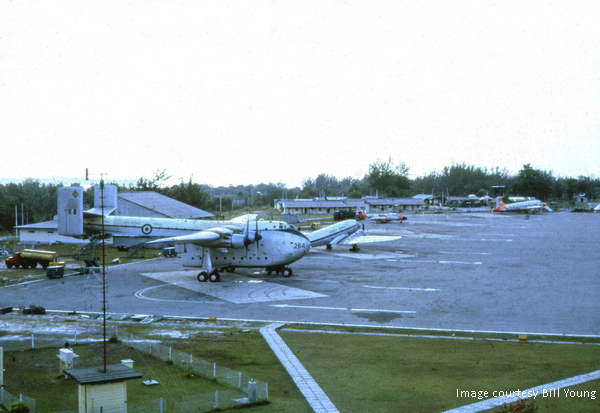 The original flights to Singapore were in a Hastings, replaced by an Argosy in November, '63." "All that technology and they still couldn't find their way home!" This is a shot of the Grumman Tracker. It came from USS Hancock after its refit and return to South China Sea. "The US Navy paid us an unscheduled visit on one occasion. 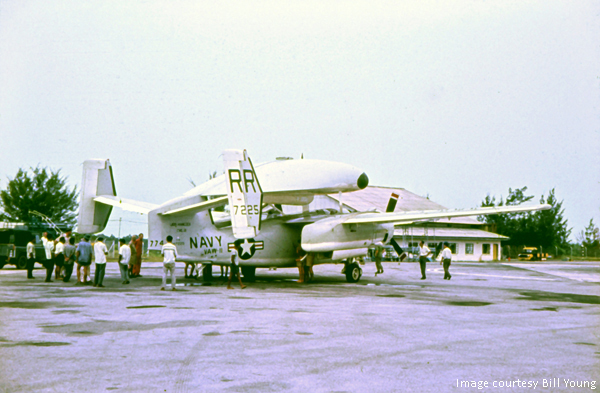 A Grumman Tracker with a full AWACS-type radome made a surprise visit to Labuan. It had run out of fuel as it couldn't find its parent aircraft carrier! So much for technology! The octane rating of its fuel was higher than anything we stocked so we had to ask Shell for a special delivery. A Pilatus Porter PC6a visited the base as part of a sales tour. It had a special extended duration tank in the passenger bay. The CO, W/Cdr Thomas, had a shot in it. 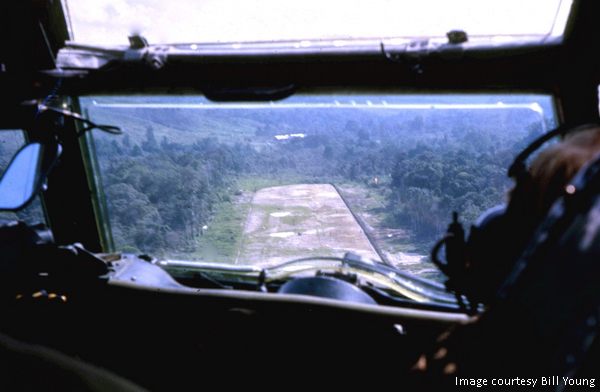 They landed on the dispersal area as it only required about 20m to stop with full reverse thrust." 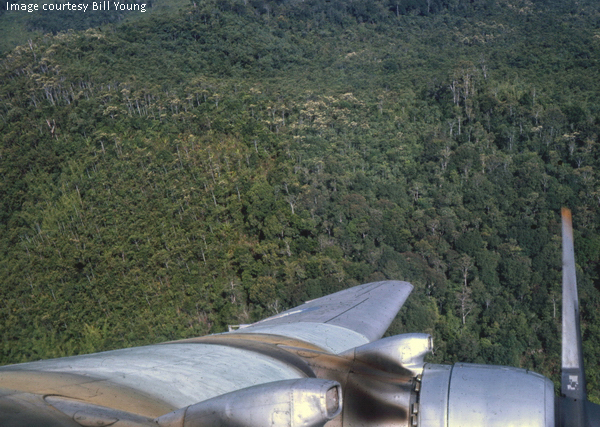 Does that escarpment and those distant, jungle clad, hills bring back memories, or what! 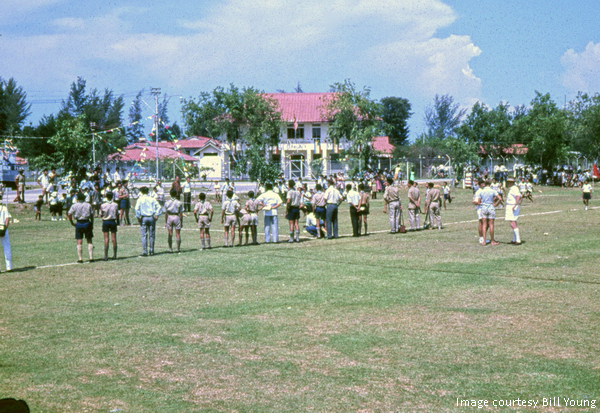 The Padang and Police Station on the day of Sabah Merdeka. "Several service personnel and airport staff took part in the sports meeting, including myself. I had trained for the cycle race but I wrecked my tyres the night before the event and had to withdraw. Someone suggested that I run in the cross-country race as pacemaker for the airfield and service personnel. It turned out that my pace was too fast for them and I ended up as first "whitey" home! " 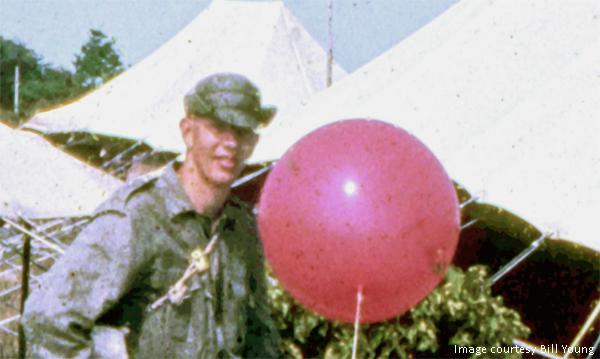 Bill Young ... is that one of his weather balloons? 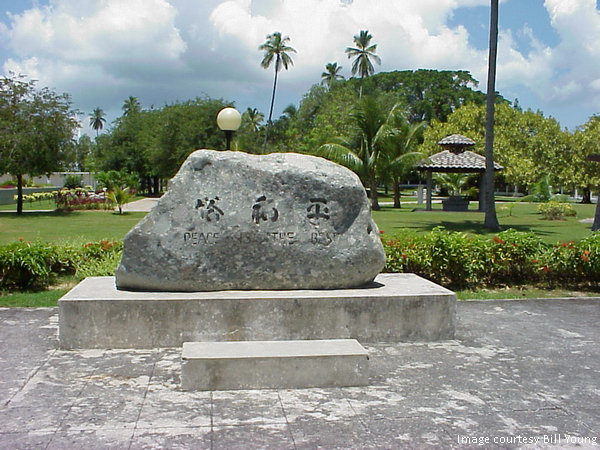 The Peace Park, Layang Layangan, Labuan. The inscription says it all. Bill, Many thanks for these stunning images that bring back so many memories. I am sure that our readers will find this page of great interest.